QThe question I have is about my mice with no whiskers on their faces. They are two little girls that are 6 months old and are very active and healthy, but they have no whiskers! Their mother also was without her whiskers. Do you think they will ever grow back? They are both beautiful mice except for no whiskers. This mouse has all of her whiskers and fur chewed clean off her nose by one of her cagemates; owned by Gina Hendricks. Photo by Karen Robbins. AYour little girls with no whiskers sound like a classic case of whisker chewing. It is not unusual for one mouse to groom the whiskers or fur off of one or more of her roommates, or they are chewing each other’s fur/whiskers off. This is almost always seen in females and can be genetic—passed on from mother to daughter. The mice usually seem to be unaffected by their loss of whiskers. I wouldn’t worry about it unless you see scabs or sores on the mice. Unfortunately, the only way they will grow back is if you separate the mice into their own cages all by themselves. I never like doing that (they seem so lonely when they live alone) so I always just live with the mice having little bald noses. By the way, are there any other mice in their cage? If so, the other mouse may be the cause. If you have a mouse in the cage with whiskers and none of the others have any, then you have the culprit—the one with whiskers is doing the chewing. This is the most common reason we see for these kinds of problems. QI have a mouse named Maggie. Her sister passed away about 6 months ago. I didn’t think Maggie would get along with a new mouse but now I am regretting my decision. What do you think? Would Maggie get along with another female mouse? QI am writing a report about mouse breeders and would like to request any information you may have on how many mouse breeders there are in the world and how many mice are sold a year. I am also interested in how many mice are sold for diabetic purposes. This information seems to be absent from online resources. Could you please assist? I greatly appreciate any help! AYou have questions that there are no answers for and that’s why you can’t find them on the Internet. There is no way to find how many mouse breeders there might be and there would be no way to determine how many mice are sold in one year. There are the small breeders that breed as a hobby to show their rats or mice and to sell as pets. 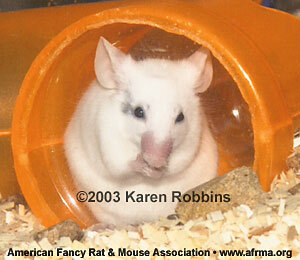 Other breeders breed different colors to sell to pet stores as fancy rats and mice. There are the herpetologists and the larger rat and mouse ranches that breed for reptile food, and I am sure that zoos would breed their own for their reptiles and raptors. And then you have ranches that breed and keep rats and mice for movies. The number of rats and mice used for diabetes is unknown. There are mega laboratories that do nothing but breed rodents to be used in various drug, food, makeup, medical research, etc., tests—you might find some of them on line—The Wistar Institute is one of them. You would be safe to say thousands are used each year for research, I wouldn’t have a clue about any other numbers, let alone how many in the world.